How to be wildly successful when your ‘other duties as required’ include accounts receivable. “You can’t be serious,” Sally said. She knew that Peter was serious when he said nothing. “You people were involved in hitting a lot of sales targets for mortgages over the last few months and years. Many of you bought second cars or paid off your own mortgage based on the commissions you earned. Now, a lot of those approvals are coming back to bite us on the behind. There are a lot of factors involved, but I don’t care. Management by objectives was popularized by Peter Drucker back in 1954. The premise is deceptively simple and often effective. First, provide a clear target (objective). It should be something that can achieve, but it should be a stretch. Second, reward them for achieving the target. The difficulty, the challenge, the rub if you will, for overall success is that in this case, the sales individual or department may achieve their objective in spite of and sometimes at the cost of the objectives for the receivables department. And of course, vice-versa. People, as pointed out so well in Dr. Lebouf’s book ‘The Greatest Management Principle in the World’, will do what you reward. Not what you want and not what you ask for – but what you reward. Write that down, memorize it. Whenever you see unusual behavior, not only in business but most areas of life, Lebouf’s Principle comes into play. The results in almost any organization is a conflict between sales and the credit/collection function. Sometimes it’s downright nasty and at other times it is healthy and out in the open, but it is always there. Some people in credit ask Whose side are they on? about the sales team. In turn, they have been known to refer to credit/collection as the sales prevention department. All in the same boat? Well, yes, but on your winning hockey team you will have skilled defensemen and forwards. The goal is winning but they do have specific responsibilities. When push comes to shove, as it so often does in the game of hockey, you better have some two-way players if you want long term success. There may be a lot of reasons what a sales representative is called upon to collect a past due invoice. However, there is one and only one action to be taken and that is to complete the sale. 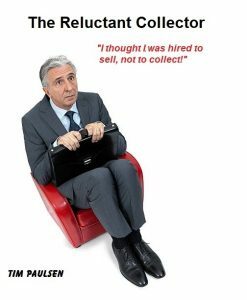 There are sales representatives who believe the sale is complete when they bring the signed order back to their office. Many a credit manager says, ‘the sale is not complete until the payment has been received.’ However, when you truly operate as though it were your company: The sale is complete when the money has been received AND the Customer returns to purchase again, on credit, paying on time in the future. This means that everyone in the firm, everyone, is involved in sales or they support the people who sell. The selling may be at the early ‘bring in the order’ stage or later, completing the sale with a satisfied and up to date customer. ‘Sales people overcome objections to making the sale. accounts receivable people overcome objections to payment not being made, isn’t it the same thing?” The answer to that question is a loud and resounding, sort of. One does need to be assertive in receivables just as with sales. One also needs to be able to overcome objections. But, the real difference is in how the customer may see you and how you see yourself. In sales, you may have many Customers who welcome your visit and your calls. Nobody, I don’t care how good you are, is happy to get a call from a collector. Let’s face it, in the past, one may not have stressed the payment terms but now must ensure they are not only understood, but followed thru as agreed. Then, when paid, you want the Customer to be happy enough that they will still want to buy your product and service. Talk about being pulled in different directions? Remember we mentioned ‘push coming to shove’? How about an EDUVATION* to improve collection performance? 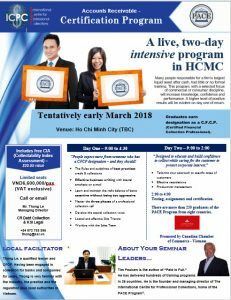 A two-day certification program in Vietnam on March 16 & 17. Take a vacation to a great country to visit and earn certification as a CFCP (Certified Financial Collection Professional). Want to hear more? *A combination of Education and Vacation – totally made up by me.